The park has a large variety of walking/hiking trails which range anywhere from a 15 minute walk to a 6 day hike. In many cases the views and floral displays are one of a kind. The diversity within this park is what makes it so spectacular and there is sure to be something to meet everyones needs. For your own safety and preservation of the park, please obey posted signs and keep to designated trails. Short cutting trails destroys plant life and soil structure. The plants in this park are susceptible to winds, rain, extended periods of dry weather, heavy snow fall and a very short growing season. We ask that you keep you pets and animals under your control and on a leash at all times. Note: As E. C. Manning Park is located in the Cascade Mountains, the hiking season is dependent on snow levels. Most high elevation trails are not snow free until late June or early July. During the winter season, hiking trails are under snow. Beaver Pond Trail – length 500 m; suggested time 15 minutes. Trail begins on Highway 3, 1.5 km east of Manning Park Lodge. This easy, level walk is an excellent area for bird watching in May and June. Although there has not been any beaver spotted in this area for several years the remains of an old beaver lodge are still visible. This pond is a different environment from the surrounding forest, one created by the damming of a spring by beavers years ago. The rising water drowned trees and shrubs but created an ideal environment for water loving plants and creatures. As you walk along the path take time for an overview of the pond. Canyon Nature Trail – length 2 km; suggested time 1 – 1.5 hour; this loop trail has two starting points. The trail begins 1 km along the road leading to the Lightning Lake Campground. Just beyond the road bridge that crosses the Similkameen River the trail is seen on the right, a parking lot is located on the left. One can also commence the trail from the Coldspring Campground. This fairly easy trail with some hills and a slight elevation change takes you through a canyon that follows both sides of the Similkameen River. Interesting plant life and geological formations are seen along the way. This trail is a short moderate hike which offers spectacular views, and is a unique place where plants from the dry interior meet those from the alpine. Flowers bloom early on the south-facing ridge, making this an ideal early summer walk. 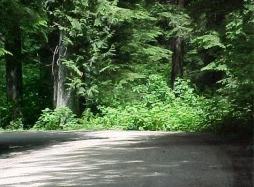 To reach the trail, park your car at the Cascade Lookout and walk up the gravel road .5 km to the trail head. Watch for the small, brown pika that lives along the right side of the road and listen for its distinctive nasal call. The Dry Ridge Trail starts at an elevation of 1650 m, so the first part of the trail passes through a moist, north facing sub-alpine forest of alpine, Douglas and amabilis firs as well as lodgepole and whitebarke pines. The ground is covered in a lacy green carpet, grouseberry and falsebox. In June, the yellow glacier lily, the delicate Spring Beauty and the endangered Steers head are in bloom. Ravens, grey jays, northwestern chipmunks and red squirrels frequent this area. Eventually, the forest opens up on the left and it is here that the dry ridge begins. Colorful crustone lichens decorate the bedrock while small plants cling tenaciously to pockets of soil. The plants here are well adapted to resist the relentless, drying winds and extremes in temperature. Look for the red leafed stonecrop with its waxy, flashy leaves acting like water bottles to retain moisture. Other plants found here have small, hairy leaves for warmth and to hold dew. Many grow in a mat formation to avoid the shearing wind. Please take special care on this trail as the plant life leads a precarious existence. Further up the trail, at an elevation of 1725 m, there is a rocky knoll covered in delicate plants. The flowers at your feet include the Sulphur Eriogonum with its round head of white flowers and small reddish leaves tucked close to the ground. Spotted saxifrage, yellow alumroot and spreading phlox with its delicate pink-purple flowers are also represented. PLEASE WATCH YOUR STEP. The trees here have been stunted and gnarled by wind and snow into “Krummholz” formations. Some sport the bright yellow-green wolf lichen. The view from this knoll is breathtaking, with the highway and lodge complex below and Lightning Lake beyond. To the left of Lightning Lake is Mt. Frosty, the highest peak in the park, with an elevation of 2439 m. Beyond and to the right of Mt. Frosty are the dramatically jagged peaks of Mt. Hozameen which, along with most of the snow-capped peaks to the south are in the United States. This a good spot to watch hawks soar on thermals above the ridge. The right fork in the trail leads back to the gravel road through a forest of amabilis fir, alpine fir and Engelman spruce. Look for the white rhododendron with its whorls of shiny leaves, the small (7cm high) fringe leafed partridge foot with tiny white flowers and the red heather with red, bell-shaped flowers. Pine-cup lichens decorate the ground, and near the end of the trail broad-leaved arnica, spirea and pearly everlasting can be found. Look and listen for the Clarks nutcracker flying near by. At this point you can return to your car via the road, which is a 1.6 km walk, or return the way you came. If possible, drive up the 7 km gravel road to visit the sub-alpine meadows with their rich variety of plants and animals. Starting point can be from the Lightning Lake day-use area or the Spruce Bay beach. The loop follows the shore line of the first of four lakes in the Lightning Lake Chain. Along the way there are several “fisherman trails” that get closer to the lake. Part way down the lake is a Gluelam walking bridge, known as the Rainbow Bridge. The hike can be made shorter by crossing the bridge and travelling back on the opposite side of the lake. The eastern portion of the lake takes approximately 1.5 hours and the western portion 1 hour. As you cross the bridge in a southern direction you will see an obvious Beaver Dam and continuing on to the western end of the lake one often spots beaver as well. As beaver are nocturnal, they are most commonly seen at around dawn and dusk. Several species of water fowl can be seen on the lake depending on the season. For information about vegetation see the Lightning Lake Chain Trail description. This trail starts at Strawberry Flats, 7.8 km off of Hwy. 3. The trail parallels both sides of the road between Strawberry Flats and the Lightning Lake campground. The elevation change is 125 metres. Paintbrush Trail – length 1.5 km; suggested time 35 minutes; after driving up the Blackwall road there are two parking areas known as the upper and lower parking lots. This loop trail can be started from either end. This fairly easy trail with some hills and elevation change introduces visitors to the fascinating world of the sub-alpine. In late spring the yellow and white spring flowers such as avalanche lilies, western anenomies, Western Spring Beauty etc. are abundant. The second bloom, which is what most people see, is from mid July to mid August. Rein Orchid – length 500 m, suggested time 15 minutes. The trail begins 1.1 km along the road leading to the Lightning Lake Campground. View the orchids and other bog flora June through July. The best time to see the white rein orchid is in July. The trail passes through a mature spruce forest and alongside some beaver formed ponds. Located on Hwy 3, approximately 9 km east of the west portal. This trails winds through vegetation decidedly coastal. 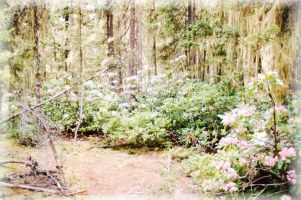 The trails principal attraction is the rare and lovely shrub, the red rhododendron, which blooms in great profusion in mid June. Even without their flowers the shrubs are handsome with their varied and interesting shapes and great whorls of big, shiny, evergreen leaves. This relatively flat trail begins at Strawberry Flats, 7.8 km off of Hwy 3. The first 1.8 km portion of the trail, which is an old fire-access road, leads through an area known as Strawberry Flats. Its name comes from the abundance of wild strawberries that can be picked in late July. There is a fantastic diversity of floral species in this very small area. 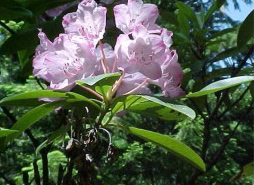 The peak flower bloom is usually in mid July. Continuing along, the trail follows through meadows, forest and talus slopes. The Strawberry Flats trail ends at the down hill ski area and the Three Falls trail continues on to Shadow Falls, at 3.1 km, Nepopekum Falls, at 3.2 km, and the descent to Derek Falls, at 4.5 km. This is the end of the trail and consists of a large area of rocks that are perfect for taking a rest or having a bite to eat. One must return the same way they came. The trail begins at Sumallo Grove (10 km east of the west entrance to the park). View magnificent stands of Western red cedar and Douglas fir as well as spring wood fern, sword fern, mosses, shrew moles, Sitka spruce, devil’s club, goat’s beard, vine maple, sapsuckers, black cottonwood, red alder, Western hemlock, foam flower, wild ginger, and Queen’s cup. Along the road way an area is visible where four hundred year old cedars worth $10,000 each were cut down and stolen during the winter of 1996/97. The trail begins at the parking lot just past the turn off to the Lightning Lake Day Use area. Although this walk takes approximately 20 minutes to complete, its name originated because it once took twenty minutes to reach the lake by foot from the old park center. This lake contains an abundant variety of aquatic life. View Point Loop – this short sub-alpine meadow trail has a variety of floral species; the trail overlooks a valley where one can often see deer grazing below as well as hoary marmots running along the grassy slopes. One can either walk out to the view point and back or continue walking along the Heather trail for awhile and then walk back or loop back to the parking lot. Engineers Loop – this 15 minute trail starts in the parking lot at the west entrance to the park. Take a step into a part of British Columbia’s past. This short walk will lead to the Engineers Road built in 1861 to take miners to the gold rush of Rock Creek and the Kootenays. The impressive rock walls are the foundation of a route that saw hundreds of men trudge the distance from Hope to the Similkameen with pack horses laden with supplies. From 1857-1863 the Royal Engineers helped to lay the foundation of the roads, survey the land, plan the tour, draw up the maps and even settle the dispute of the new colony of B.C. When their tour of duty in BC ended most quit the army and settled here. One of their tasks was to survey a route to the gold fields at Rock Creek. Miners were flooding across the border with supplies, mining the gold and then exporting it back to the US. All this without paying import taxes or duty on the gold. It became obvious that if sovereignty was to be maintained a “good mule road from Hope to Similkameen” would have to be built. Edgar Dewdney of Hope was the low bidder at 76 pounds sterling per mule. In 1861 portions of the Dewdney Trail were widened and upgraded to a wagon road by the Royal Engineers.